Hi all, Well, its school holiday time! We both have the week off, and on Tuesday a sou-west wind was blowing so it was time to christen the new dropper rig. Te Arai Point was our destination. It was a good learning curve but we ended up with a tangle! Nevertheless a nice gurnard to whet our appetite for more. Today, 2nd October, fine weather and good sou wester. Into the car at 8.15 with the grandchildren and off to Te Arai. On arrival we found we had to walk a bit as there were three other kites out and a plastic bag. We noted that all the other kites were flexiwings from Paul's. We used out nighthawk kite We put the lessons of Tuesday to good use and had a really good set, much to the fascination of the grandchildren. We left it our for an hour and the retrieved. The shouts of the grandchildren at sighting the first fish could well have been heard in Auckland. Total catch - 6 big gurnard and one snapper. Jenny and I looked at each other, then at our watches. Why not, and out the line went again. Unfortunately a wind change meant we had to retrieve early. Nevertheless, another two gurnard increased our catch to eight plus the snapper. 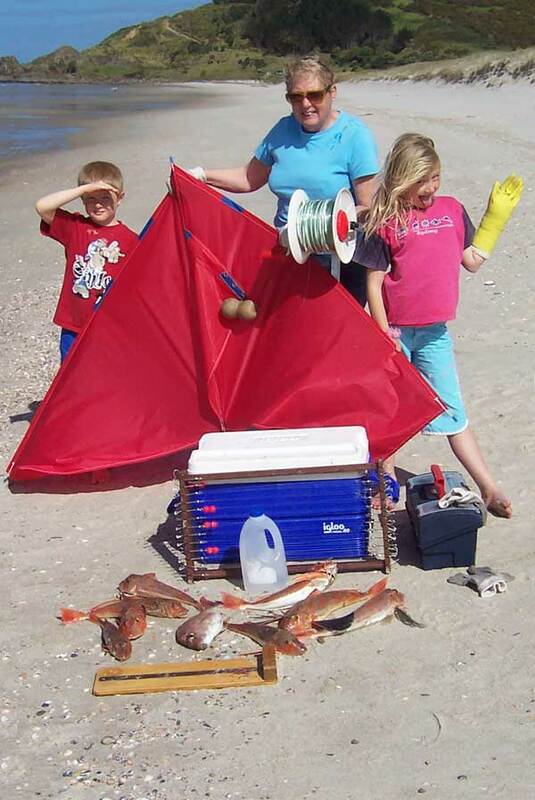 The attached pics show Jenny, and our grandchildren, Bethany and Eric, with our gear and catch. Murray is the photographer Te Arai Point in the background. A fun day and thanks to all at Paul's, particularly Rob, for your help. Merry Christmas and a Happy New Year from the team at Paul's Fishing Kites. Resume normal hours Jan 5th. The West Coast of the South Island between Greymouth and Westport is a great area that I’ve wanted to kitefish for a while. 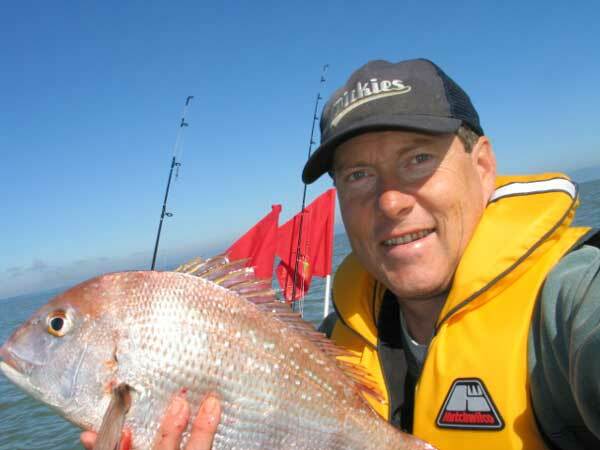 Last week I met Doug while doing some contract near Westport and Greymouth with my wife Ceillhe and it turned out that he, too, loved Kite Fishing and other types of fishing too. He has been doing Kite Fishing (using Paul’s Kites of course!) for many years now and we decided to go out on a beautiful but cold winter’s morning. 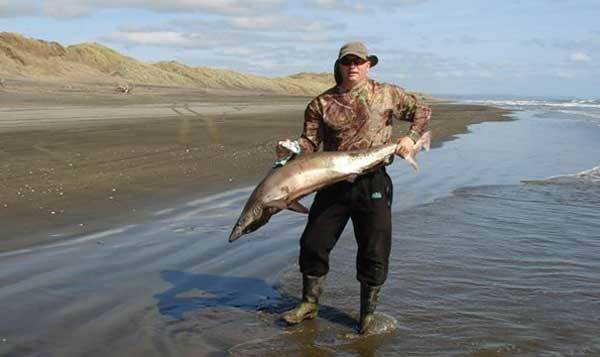 Greymouth is now also well-known for its amazing Bluefin Tuna Fishing, which takes place each Winter. We met early about an hour before sunrise on a freezing cold morning with a temperature of just over freezing point. When considering wind chill it was actually about -2 Degrees Celsius, so something that separates the men from the boys. Doug has his Kite Fishing well-sorted, with all his gear in very good nick and always ready to go. He had even already baited up all the hooks before I arrived - very impressive! The easterly breeze of about 15 knots took the kite out to sea, along with 10 fishing hooks baited mainly with Squid but interestingly, also a Prawn. The gloves we had taken with us were more than welcome, since it does help when fishing to be able to feel your hands. There was an spooky sort of mist on the water, which made the start to the day quite mystical. We left the baited fishing hooks out to fish for about 30 minutes before slowly winding in the fishing line. When it came closer to shore just at daybreak, it was a sight to behold. We caught 6 sharks – local grey sharks - plus a red cod that had his tail bitten and a large portion of his middle “sharked”. It was a great sight with the Mountains behind us, the wild ocean in front of us, with some freshly caught fish for dinner waiting to be prepared by a few local families. Doug did manage to save a bit of the nice flesh from the “sharked” red cod and it tasted great that evening, freshly fried in the pan just with some butter. Doug was very popular again at work that day, even bringing his workmates pre-filleted fish for their dinner! It was another fantastic experience and I can’t wait to get back there. Something tells me it might just be around August, so I can combine Kite Fishing with the possibility of having a crack at those giant bluefin tuna further off the coast. 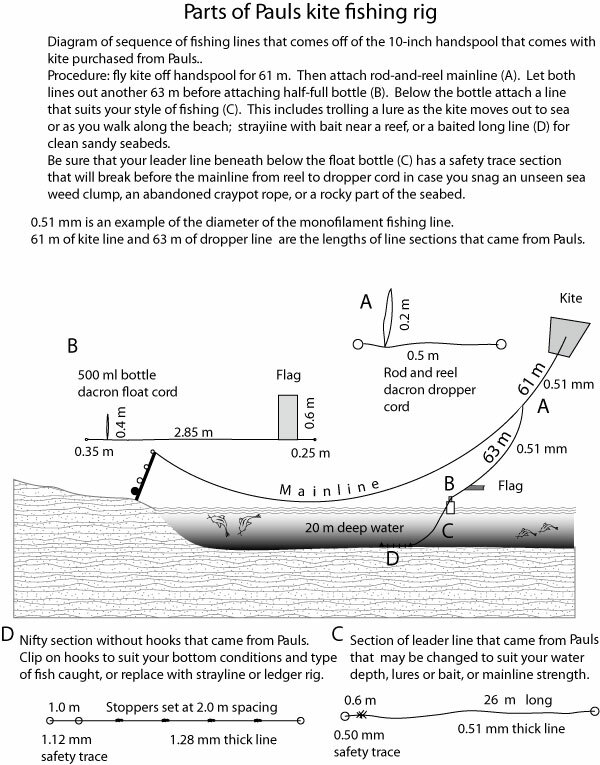 Doug and I plan to try a few things with my Paul’s Kites Flexiwing Kite and I can’t wait. Did anyone ever say that Kite Fishing in the South Island isn’t successful? Doug certainly knows his stuff and we can prove otherwise – see photos! By the way, the Shark tasted beautiful too. 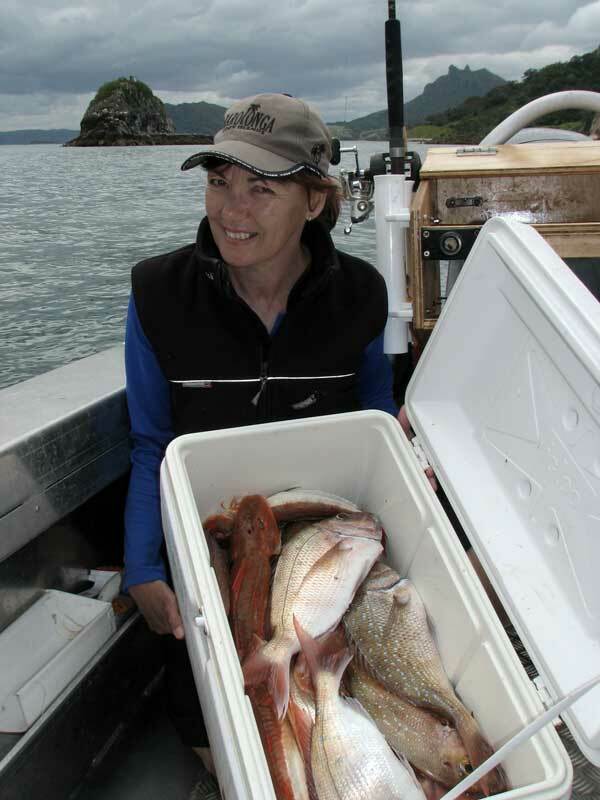 Our boat long line has filled the bin and freezer this year thanks to the Whangarei Harbour entrance and Bream Bay. Through the winter we have had quite a few trips where the gurnard have come in one on every hook and quite a few of them around 45cm in length. These were found in about 22m around fairway marker a couple of kms from the heads, quite handy. Kahawai or the like was on their menu. Thank goodness Cathy loves the feel of 20 fish on the line and she pulls that aboard while I wind the reel and stow the hooks back in the rack. Of course, being able to unclip the fish and sling them into the fish bin is a real convenience, something you can’t do with the old style lines. We are currently running 5/0 target hooks with a little flasher material for luck. The snapper are back now and we have had a number of bumper trips in December, resulting in some pleasing eaters to 35cm and a number of 30cm ones that are easily unhooked and released. Filling the bin from the longline at the beginning of the day then letting the visiting crew dangle baits the rest of the time is the way to go. They will thank you at dinner time, because as long liners know, all the big ones try to stay well clear of boats, but love to munch on a target hook. 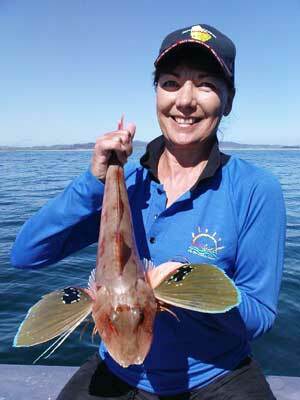 We just lay the fish in a 30cm length of Marley spouting with one end blanked off so the fish’s head is against it. If the V of the tail is inside the end, then its freedom for the snapper. You can see the measuring device in the photo of Cathy below - it is to the left of the chilly bin. Don’t be afraid to use pillies on the long line and pump it up and down a couple of times at 10 minute intervals, it seems to work well. I’ve got a couple of innovations to test in January, top secret at this stage. All will be revealed. Hi there, I just bought a kite from you and here is some of the first catch. 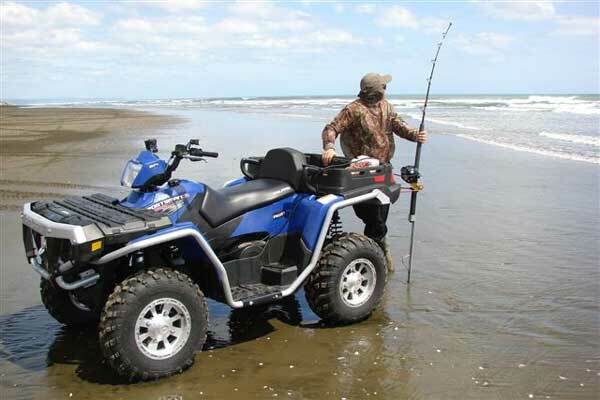 We are using our Polaris 500 x2 to get us around and an electric Daiwa fishing reel to winch kite back. It's a really enjoyable way to spend a day! Thanks!! I've tested it extensively and it really works. 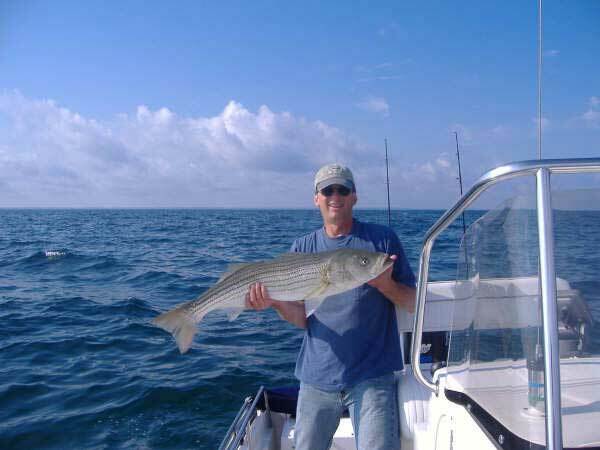 PS Here's a striped bass I caught in Cape Cod Bay, Massachusetts. I am having fun with my Pocket Sled kite, and all the other nifty innovative hooks and clips. Spot on! It takes some learning to effectively fish the varied seabeds around Kaikoura Peninsula, but I have not lost any gear yet. Beginners really don't know the details of what comes on the 10-inch spool and what should be left as is and what might be modified to suit the fishing spot for a given day. So I made the attached sketch, in part so my kit gear comes back in the same order when loaned to others who want to learn more about Pauls Kites.